CMS is one of the two general purpose detectors for the proton-proton collider of CERN, the Large Hadron Collider (LHC). The main purposes of the LHC are to study the mechanism of spontaneous symmetry breaking in electroweak interactions and to explore physics beyond the Standard Model. LHC is a discovery machine and, as widely known, in July 2012 CMS observed a particle which is consistent with the Brout-Englert-Higgs boson. 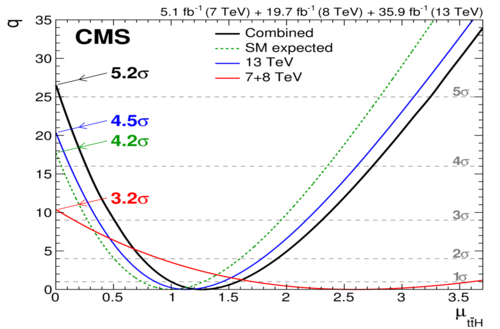 The paper which details the observation of this new particle with a mass of around 125 GeV by the CMS experiment is available at this link: Phys. Lett. B 716 (2012) 30-61. Following the discovery of the Higgs boson by the ATLAS and CMS Collaborations the 2013 Nobel Prize for physics was awarded to François Englert and Peter W. Higgs "for the theoretical discovery of a mechanism that contributes to our understanding of the origin of mass of subatomic particles, and which recently was confirmed through the discovery of the predicted fundamental particle, by the ATLAS and CMS experiments at CERN’s Large Hadron Collider". CMS is not only a place for discoveries, it also allows physicists to study Standard Model processes more deeply as for example top quark physics, as well as heavy ion collisions at unprecedented energies. CMS is an international collaboration in which Belgium and in particular Brussels (ULB-VUB) has an important participation. The CMS Brussels groups are very active in the high energy data analysis, both looking at tests of the Standard Model predictions at the high energy frontier and the search for new physics beyond the Standard Model. These studies are performed in many different areas, which are detailed below. Links to the different topics are given in the left frame. The IIHE is the part of the global research be.h network funded by the Belgian EOS programme and it is aimed at studying the Higgs boson for a precise determination of its couplings within the SM, including the self-coupling. The scope of this research project spans six comprehensive work packages ranging from the SM precision measurements to the new physics searches in the Higgs boson sector at CMS. At the IIHE we are strongly engaged in the study of the properties of the Brout-Englert-Higgs boson and we address it in several complementary ways. scalar particle at high mass thanks to its high branching ratio. As the result, the limits are set on the product of the cross section and the branching fraction for its decay to ZZ for a wide range of masses and widths, and for different production mechanisms (JHEP 10 (2015) 144, JHEP 06 (2018) 127). 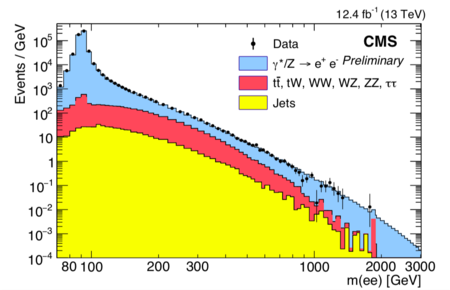 The measurement of the ZZ diboson production cross section and the tests for possible deviations from the SM predictions. This process represents one of the important backgrounds in the study of the Higgs boson to to ZZ. The analysis is done in 2l2nu and 4l channels. The selected data were also analyzed to search for anomalous triple gauge couplings (aTGC) involving the ZZ final state. The results are documented in CMS-PAS-SMP-15-001, Phys. Lett. B 740 (2015) 250. The search for H -> tautau decays in the ZH associated production mode. The combination with the gluon-gluon fusion and vector boson fusion production searches led to an evidence for the decay of the H boson to tau leptons (Phys. Lett. B 779 (2018) 283). Th di-tau decay mode is also powerful to discover BSM physics in an extended scalar sector. The IIHE has contributed to the first observation of the ttH process with the direct measurement of the top quark coupling to the Higgs boson (Phys. Rev. Lett. 120 (2018) 231801). The main contribution was in the analysis of the multilepton channels with the Higgs decays to WW, ZZ or two tau leptons. The IIHE is also involved in the study of the top quark associated production with the Higgs boson. This allows to additionally probe the sign of the top quark Yukawa coupling. Althought the top quark sector is accessible for dedicated research since its discovery in 1995, it remains a very rich and broad research domain with many unexplored aspects. Various event topologies of proton collisions in which top quarks appear are either described by the Standard Model or predicted in models beyond the Standard Model. The phenomenology of the top quark sector is strongly connected to the mechanism(s) of electroweak symmetry breaking and has in general an important interplay with supersymmetric models, models including a fourth chiral generation and models with extra spatial dimensions. The top quark sector therefore has a very rich and divers phenomenology which opens a variety of experimental challenges to be studied with the CMS experiment at the LHC. The study of the measurement of the mass of the top quark, and the interplay with the data-driven jet energy scale calibration techniques. The verification of the equality between the top and anti-top quark masses predicted by the CPT symmetry is a key element in our Quantum Field Theoretical description of particle physics. The probability for the top quark decay process to happen is reflected in the top quark decay width and its precise measurement is an important tool to validate the theoretical predictions and to search for new physics phenomena. The study of the measurement of the cross section of top quark pair production, together with the interplay of data-driven techniques to estimate the b tagging efficiency and of the different backgrounds. The precise measurement of the four top production cross section is a valuable test of higher-order perturbative QCD calculations and new physics models. Some of these models predict enhancements in the observed tttt cross section, with the associated kinematic distributions remaining similar to those from SM production. 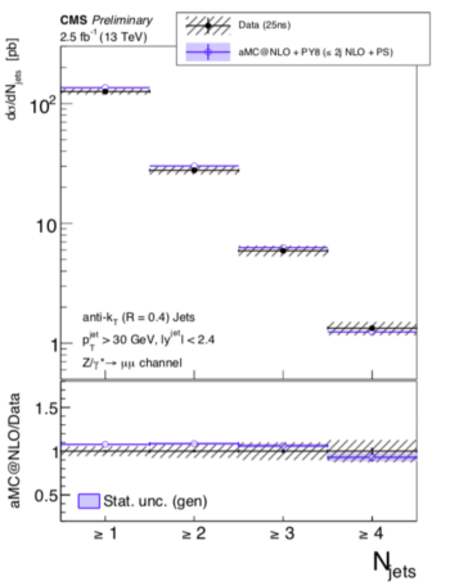 The IIHE leads the analysis of the four-top quark production in the l+jets and 2l OS channels (Phys. Lett. B 772 (2017) 336). It is particularly interesting to measure the cross section of the top quark pair production in association with additional heavy flavour jets (tt+bb, tt+cc). The strong implication of the IIHE in the heavy flavour tagging techniques for b and c jet identification represents an excellent environment for such kind of studies. The LHC data allows one to set strong limits on the flavour-changing neutral current (FCNC) processes in association with the top quark. Such processes are forbideen at tree level and are only possible in higher orders. However, in several BSM scenarios the FCNC rates can be significantly enhanced with providing a probe of the new physics phenomena. The IIHE is strongly involved in FCNC searches with top quarks with studying the top-Z and top-H anomalous interactions via the neutral currents. While the top-Z search aims at the study of the tri-lepton signatures (CMS-PAS-TOP-17-017), the top-H analysis includes H->bb (JHEP 06 (2018) 102) and H->multilepton channels. The Wtb interaction vertex has a rich and mainly unexplored phenomenology to be observed in the V-A form of the top quark decay. This study may provide insights in the mechanism of electroweak symmetry breaking or indirectly argument for physics beyond the Standard Model. Also the W helicity and the predicted spin correlations can be measured at the LHC (JHEP 10 (2013) 167). The search for the fourth generation quarks (and possibly squarks) at the LHC is based on signatures similar to those of the third generation. The interpretation of these phenomena depends strongly on the base model considered, for example the Standard Model or models beyond the Standard Model like supersymmetric models. The high centre-of-mass energies obtained at the LHC provide a new window to study these phenomena. In the search for supersymmetric phenomena at the LHC, the Standard Model processes with top quarks are usually the dominating background. Also top quarks can appear in the cascade decays of supersymmetric particles. This motivates a dedicated study of supersymmetric phenomena in the top quark sector. The study of the production cross section of the Drell-Yan process in proton-proton collisions provides an important test of the perturbative quantum chromodynamics (pQCD). This process represents one of the dominantbackgrounds for various SM precision measurements, including top quark pair production and the Higgs boson studies, as well as in the new physics searches. The comparison of the measured differential prodution cross section of the Z boson with theoretical predictions is a key to understand and model QCD interactions, hadronic jet production and gluonradiation.The measurement of the hard jet transverse momentum is sensitive to the parton distribution functions (PDF), while the measurement of the jet multiplicity validates the completeness of the simulated process where matrix-element calculations are combined with the parton shower evolution. 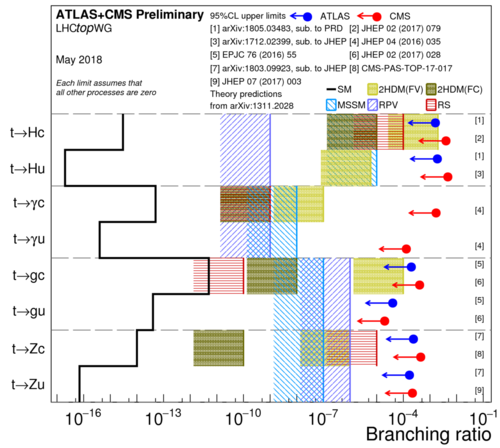 The IIHE is leading the study of the Drell-Yan process in di-lepton final state and has contributed to several CMS results: JHEP 04 (2017) 022, CMS-PAS-SMP-15-010. The unprecedented high energy of proton-proton collisions at LHC gives access to the exploration of the phase space with the creation of high mass particles predicted in various new physics models. Such particles can manifest themselves as the dilepton and diphoton resonances associated with the high invariant mass and can appear in Grand Unified Theories (GUT) and extra spatial dimensions. The analysis is specifically optimised in order to have high efficiency for the leptons with very high transverse momenta. The IIHE is actively involved in the searches for high mass resonances and has contributed to the following CMS results: Phys. Rev. Lett. 117 (2016) 051802, CMS-PAS-EXO-16-031. Dark Matter was postulated almost a century ago to explain discrepancies between the observed matter content of the universe and the one inferred from gravitational calculations. Since then the thesis of the existence of a so-far invisible, weakly interacting massive particle (WIMP) has only gained further ground. From precision measurements on the cosmological microwave background, in particular, we know that ordinary matter accounts for only 17% of the matter content of the universe. Dark Matter in the form of WIMPs or other incarnations has and is been searched for through indirect as well as direct detection experiments. The former try to detect annihilation of Dark-Matter particles, while the latter try to establish effects of Dark Matter elastic collisions off nuclei. A more recent third approach is to produce Dark Matter particles in the laboratory, at colliders. In Brussels, we participate in the search for direct Dark Matter production in the CMS detector at the Large Hadron Collider. 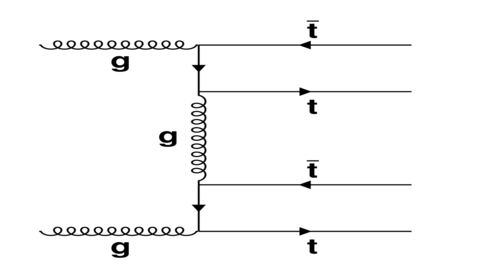 In the case of the direct production of a pair of dark-matter particles, there is in principle no observable trace left in the detector, since the dark-matter particles leave the experiment without interacting and with energies balanced to a zero net effect. However, by searching for a single visible particle (a quark, a photon, a W or Z boson,...), one can search for collisions where the dark-matter particles are produced in recoil against the visible particle. This is the main strategy pursued in the LHC searches for direct dark-matter production. The IIHE has contributed to the construction of the CMS Silicon Strip Tracker. This Tracker is built of ~16,000 silicon strip detectors, of size ~10 x 15 cmÂ², arranged in cylindrical layers in the barrel, and in wheels in the endcaps. The IIHE was responsible for the procurement and participated to the tests of the ~17,000 pitch adapters allowing to connect the readout strips to the readout electronics, and for the procurement of the ~17,000 frames supporting the silicium wafers and the readout electronics. In addition, most of the frames needed for the endcap wheels (~6,500) are being assembled in Brussels. A significant fraction of the endcap detector modules (~1,500) are assembled at the IIHE on a gantry. A set-up to assemble and long term test sectors of wheels equiped with ~20 detectors, named petals, was installed and should deliver ~40 tested petals.The IIHE engineers and technicians also provided several pieces of equipment needed for the Tracker construction. For example, they machined pieces and built the electronic boxes needed to operate the 9 gantries of the collaboration. The optical electronic system used for the petal tests and the test system for the light generator for the hybrids were developped by an engineer from the IIHE. The current activities in the silicon strip tracker were recently expanded towards the CMS phase-II upgrades. The increased radiation damage and unprecedented high pileup at HL-LHC represent important challenges in the contruction and operation of the new Tracker. Members of our team observe and have observed several coordinating roles in the experiment related to this vital effort. The IIHE is now responsible for the construction of a new CMS Tracker Endcap for phase-II with hosting several experimental and instrumentation areas for the assembly and tests of the built silicon modules. The IIHE is also leading the development of the firmware for the new Tracker. A crucial ingredient for many analyses in CMS is the accurate identification of jets originating from b quarks. The importance of this topic is illustrated by the fact that about one third of all CMS publications relies on heavy flavour jet identification. At the IIHE, particularly the subjects of SM scalar and top quark physics, as well as many searches for beyond the standard model phenomena, rely heavily on the identification of heavy flavour jets. Former and current IIHE members had a leading role in the CMS collaboration in improving the b jet identification algorithms (S. Abu Zeid, K. Deroover, S. Moortgat) and developing charm quark identification algorithms (S. Moortgat) as well as to commission heavy flavour tagging variables with the 13 TeV proton collision data (K. Deroover). S. Moortgat also contributed profoundly to the validation of the simulation using the data. As a result of all of his contributions, S. Moortgat was appointed during his PhD as coordinator of the performance and validation activities within the BTV group in the CMS collaboration in 2017 and of the software activities in 2018. Three IIHE member have been elected conveners of the vertexing and heavy flavour identification group (BTV) in the Physics Coordination of the CMS experiment during their potdoc: FWO postdoc P. Van Mulders (2014-2016), postdoc Ivan Marchesini (2016-2018), FWO postdoc Kirill Skovpen (2017-2019). This ackowledges the leading role covered by IIHE in this field. Also thanks to the leadership of IIHE members, CMS has managed to smoothly and successfully complete the many challenges in heavy flavour jet identification in the past years. 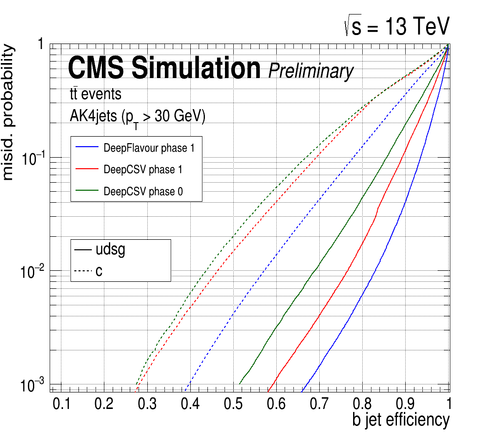 An important achievement of the BTV group is the publication of around 100 pages summarizing the state of the art of heavy-flavour jet identification in the CMS experiment for the LHC Run2 for which FWO postdoc P. Van Mulders was the editor (https://arxiv.org/pdf/1712.07158.pdf). The heavy-flavour tagging consists in the identification of jets resulting from the radiation and hadronization of b or c quarks. Algorithms for heavy-flavour tagging use variables connected to the properties of heavy-flavour hadrons present in those jets. 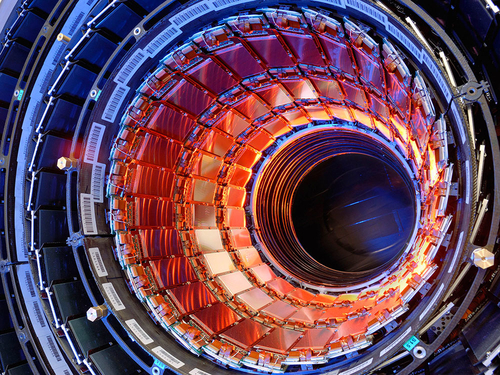 One of the remarkable features of heavy-flavour hadrons is the lifetime. The lifetime of hadrons containing b quarks is of the order of 1.5 ps, while the lifetime of c hadrons is 1 ps or less. This leads to displacements of a few mm to one cm for b hadrons, depending on their momentum, which is illustrated in the plot. The displaced decays of the hadrons give rise to signatures such as tracks displaced from the primary vertex (PV), from which a secondary vertex (SV) may be reconstructed. The displacement of tracks with respect to the primary vertex is characterized by their impact parameter (IP in the figure), which is defined as the distance between the primary vertex and the tracks at their points of closest approach. In addition to their distinctive lifetime, b and c quarks have a larger mass and harder fragmentation compared to the light quarks and the gluons, which are massless. As a result, the average transverse momentum relative to the jet axis of the decay products of the heavy-flavour hadron is larger than for the other jet constituents. In approximately 20% (10%) of the cases, a muon or electron is present in the decay chain of a heavy b (c) hadron, which is also an important feature that can be exploited for heavy-flavour identification. Given the strong involvement in the CMS heavy-flavour identification group, there are typically always several related studies ongoing at IIHE. Areas of involvement are both performance measurements and software improvements of the algorithms. Improvements can be achieved fine-tuning the observables used by algorithms and/or exploiting cutting edge software tools. 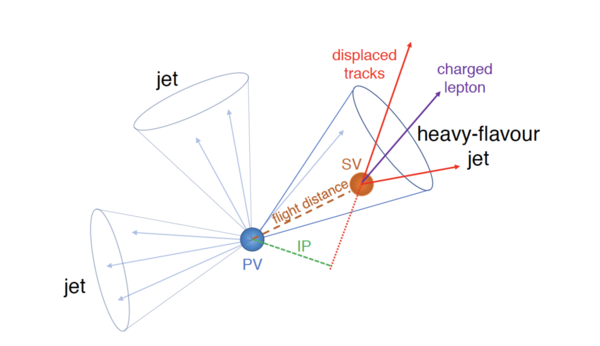 Identification algorithms of jets from heavy hadrons heavily rely on machine learning and are thus natural candidates for advanced tools like deep neural networks. The plot shows the excellent performance of CMS algorithms making use of deep neural networks, the DeepCSV and the DeepFlavour b jet identification algorithms. The curves demonstrate the probability for non-b jets to be misidentified as b jet, as a function of the efficiency to correctly identify b jets. The curves are obtained on simulated ttbar events. 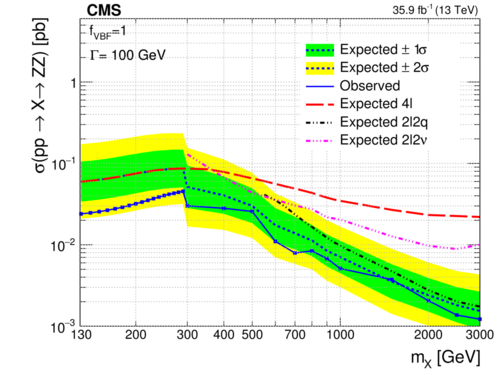 For comparison, the performance curves of DeepCSV with the 2016 CMS detector (Phase 0) are shown togehter with the curves for the current (Phase 1) detector. The performance in this figure serves as an illustration of the potential of these multivariate tools and the constant improvements being pursued by the CMS collaboration, with strong contributions from IIHE. The most recent DeepFlavour algorithm, for instance, significantly improves the performance with respect to the previous DeepCSV tagger. We regularly have positions for outstanding candidates, for the Ph.D. programme and for Postdoctoral positions! Please see our page. Open applications by candidates with an excellent research profile are always accepted, and can be sent to : iihe-jobs@listserv.vub.ac.be (no attachments) with a short summary of the candidate's research background. We will get back to you for further information. It's possible to get involved in student projects (such as Batchelor/Master/Erasmus projects) on most of the phyisics topics introduced above in this page. At our institute, it is possible for physics students to do a study with real proton collisions from the LHC. These studies are always a combination of theoretical and experimental aspects and cover a very broad range of topics. Student projects typically also form students to the usage of useful software tools. Most of the studies are performed using the C++ programming language, python, and make extensive use of the ROOT framework (which provides many useful tools relevant for data analysis). You can contact the CMS Academic stuff members listed here, if you would like to join us for a student project. They will let you know about the current open options that are suitable for you.